If you’re anything like me by the time Saturday hits your fridge looks pretty bleak. All the showy vegetables like asparagus and bok choy were the first to go,with boring but reliable cruciferous veggies making an appearance mid-week and by Friday you barely made due with a few sprigs of kale some wrinkly mushrooms. Saturday is, in other words, shopping day…Or at least it should be. But I often like to push things just a little bit further by bringing together my two great loves: saving money and making soup. This soup is downright Dickensian but it is comprised not of vegetable remnants (ie. the last few sprigs of this or that) but the seemingly unusable scraps or…in this case…stems of hearty cruciferous vegetables. These stems, along with the split peas, make for a nice thick soup without the use of a roux or additional potatoes. A perfect meal or snack that will last you all the way through the weekend and maybe even to your Monday lunch hour. 3 broccoli stems, sliced into discs. Make sure to use only the top 3/4 of the stem and discard the very bottoms as they are too “woody” and won’t blend well. 1 cauliflower stem, roughly chopped. Avoid leaves and the “base” of the stem but use everything else. 1 cup dry split peas, rinsed. Add 6 cups of water and boullion. Bring to a boil then reduce to simmer. Simmer uncovered for about 40 minutes, stirring occasionally. Since much of the liquid will have absorbed, add an additional 3 cups of water and return to a boil. Then continue to simmer on low for an additional 20-30 minutes. Add almond milk, coconut milk, turmeric, nutritional yeast and sweetener. Serve soup with extra coconut milk on top, chopped chives, smoked nuts or paprika. Do you save your refrigerator remnants? Or do you have a favourite pauper food? Great recipe! I am always unsure of what to do with the stems from broccoli, etc. Will have to try this weekend! Oh man! 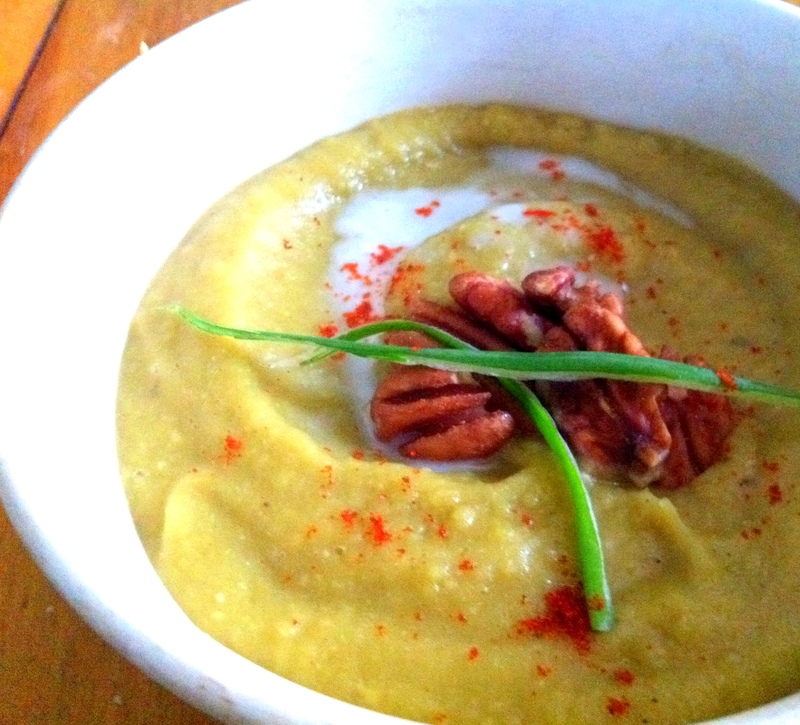 I wish I had seen this last night– I tried my own variety of remnant split pea soup and the few little additions you did (tumeric, almond milk) would have really jazzed up the flavor. So awesome! Who doesn’t LOVE split pea soup in the winter? Love split pea soup! In a pinch I adore Happy Planet’s Indian split pea soup!